Liquid Light is an international photography exchange project between the East Midlands and Jamaica. The first leg of the exchange is about to get underway. Two Jamaican photographers have packed their cameras and travelled over four thousand miles to inspire and be inspired, as part of a unique art exchange project in the East Midlands. The Liquid Light project links the East Midlands with Jamaica through a shared interest in the arts. It is part of the national Spirit of Friendship Festival, linked to this years Commonwealth Games and Golden Jubilee. The visit also coincides with the celebration of forty years of Jamaican Independence. 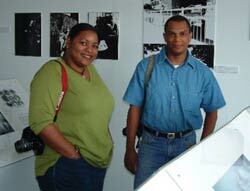 Arlene Brown (28) and Andrew Smith (33), both from Kingston, will spend six weeks in the region. They will tour each county and share their skills through a series of photography workshops and artist talks. Two artists from the East Midlands, Zoe Childerly and Michael Forbes, will work alongside the Jamaican photographers, having been chosen to visit Jamaica in the autumn. In Corby, Northamptonshire, they will spend two days with a class at Studfall Junior School. The group of year 5 children will use digital cameras to photograph Kirby Hall and Rockingham racetrack, to show the diversity of their county. In Leicester, a group of young people from the African Caribbean Centre will work with Arlene and Andrew at Picture House Centre for Photography. They will try to communicate the importance of friendship through photographs and the results will be displayed on t-shirts. When they are not busy running workshops or talking to the region's photographers, Arlene and Andrew will find time to create their own new work. They have been set the challenge of using photography to capture the essence of the region, from the rural charms of Lincolnshire and Northamptonshire, through to the wilds of Derbyshire and the diverse urban cultures of our major cities. Arlene and Andrew are particularly keen to photograph the Leicester Caribbean Carnival, which happily coincides with their visit. Picture House have been the official carnival photographers for the past decade and will be launching a special exhibition to welcome their Jamaican guests. The images, music and costumes celebrating 10 years of the popular city event will undoubtedly inspire Arlene and Andrew. The exhibition begins on Monday 29 July and runs for six weeks. The Liquid Light project is supported by the Spirit of Friendship Festival, East Midlands Arts, Visiting Arts, the British Council in the Caribbean, the Institute of Jamaica and Jessops. 6, 7, 8 Aug Charnwood Arts. Loughborough, Leics.